The flowers are beautiful, what a wonderful picture. Happy pink Saturday. Winter is just around the corner in my neck of the woods and I won't see much pink in my garden again until at least April so THANK YOU for the wonderful blog entry and for giving me a little pinkie-lift today! That is so pretty! Happy Pink Saturday! How beautiful. Thank you for sharing your lovely blossom with us. I hope you are having a wonderful day. The flower is so beautiful! Thank You for sharing your Pink! Is this the same as Desert Rose? 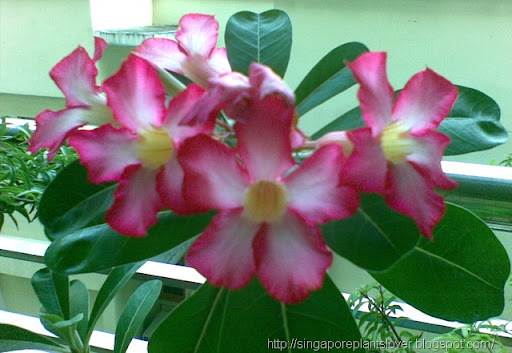 I miss my plants I had in Singapore, esp those I can't grow here. Glorious flowers, and a wonderful colour. Thanks for sharing.